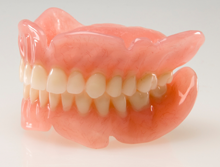 Full dentures are prosthetic teeth that replace all teeth on the upper and/or lower arch. Partial dentures fill in the space left by one or more missing teeth. Full dentures usually rely on adhesives or suction for stability, and partials attach to neighboring teeth with clasps. If you'd like a more stable denture solution, ask about implant-retained dentures.